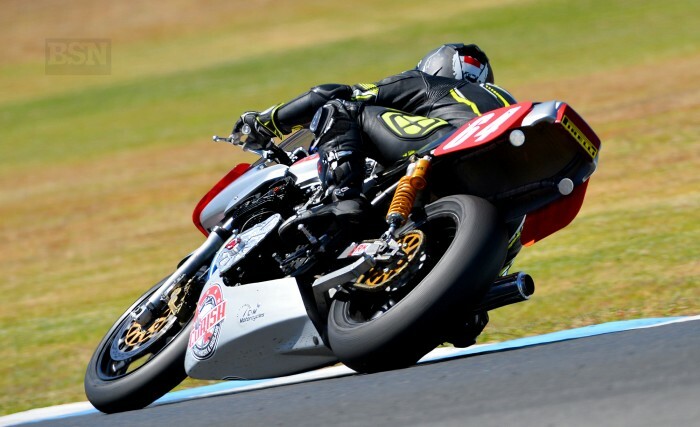 While Australia’s Aaron Morris took two wins from two starts from pole position today in the International Challenge at the Phillip Island Grand Prix Circuit, it wasn’t all smooth sailing for the 26-year-old. The opening six lap race, which was restarted after Jason Pridmore and Beau Beaton had an almighty crash at turn eleven, was a little bit difficult for Morris. It was the first time that Morris had done a race start on the Corish Motorsport Suzuki Katana. According to Morris, the clutch acted a lot different to any other bike that he has ever got off the line. Heading into Doohan Corner, Morris was sitting in ninth which made for a difficult start to the first part of the race. Then the race was red flagged due to the crash. On the re-start, Morris had the same issue with getting off the line. In saying that, he got a slightly better start as he was seventh heading into turn one. “That start on the restarted race was still nothing great, but it was getting better,” Morris explained to Bikesportnews.com. “Apart from the starts, which made it hard, it was a very good day. I’m very happy with how both races went,” added Morris, who posted his fast lap of the day in the second race with a 1min36.730 on lap two. Race two wasn’t too bad either for Morris, who ended up beating the former Australian and World Endurance Champion Steve Martin by 4.250 seconds. When fellow Australian rider Jed Metcher went down at MG Corner on lap three, Morris didn’t realise he had that much of a gap to Martin. “I was still sort of pushing in race two. During the race we started having some gearbox troubles. We think we might have a selector drum issue,” explained Morris. It’s simply one of those of things. Morris was meant to have a new motor for this weekend, with all the new revisions, but TBR didn’t get it finished in time which means Morris is running with some of the old problems. Morris believes he is in for a pretty good shot at taking another two wins tomorrow. At the end of the day he still has to get the bike fully sorted. “I’m pretty confident that it will work, but we’ll wait and see. Anything can happen tomorrow. The way my starts are going, it good be hit and mist. However, I’m feeling reasonably confident. “If I’m in the top four heading into turn one I believe we are in for a pretty good shot,” concluded Morris, who leads Josh Hayes by five points in the run for the Ken Wootton Perpetual Trophy.